So, here I sit in my living room, looking out over the frozen St.Peters Bay, having just finished reading "Sailing the Big Flush", a funny and engaging non-fiction book by Eileen Beaver. The story of a self-described "pampered sea-tipper from sunny California who ends up as a plucky, menopausal first mate" on a 25 foot wooden sailboat captained by her husband Doug as they sail for a month on the huge tides of the Bay of Fundy. Filled with stories of the people they meet in Nova Scotia, the beauty and challenge of sailing the Minas Basin and Bay of Fundy, and Eileen's personal journey, the book was the perfect antidote to a winter day on dry land. This summer, Eileen Beaver dropped a signed copy of the book off at The Turret Bell, our bookstore at St. Peters Landing in St. Peters. I was sorry I was not at the store that day to meet her as Jay and I were - you guessed it - out sailing on Obsession. But I would like to hear more of her and Doug's sailing sagas. Thanks for a great read, Eileen. Michelle and I live in St Peter’s Bay, Prince Edward Island. This is a beautiful part of the province, with our house looking out over the bay. The sun sets over the water during the summer, and the sight is unforgettable. Unfortunately, keeping our boat here is not an option. The entrance to the bay is quite shallow, and the near-six-foot keel on Obsession would not appreciate the sand bar that lies across the mouth. When we bought our boat, we had to decide where to keep her, and we had four main options we considered. Souris is about a 20 minute drive to the east of here, and has a relatively new marina and facilities. Cardigan is about 15 minutes south, with Montague about 5 minutes past that. The final option was Charlottetown, a 35 minute drive west, but home to the largest yacht club and community. In the end, we decided to go to Montague. We almost went for Charlottetown despite the added driving time. We thought that, being new boat owners, having a large community to draw on would be a benefit. However, Montague was a lot less expensive. Also, we knew a couple of people already who berthed there, so Montague won out for us. Montague is a very informal group. There is no official yacht club. The marina is operated by the Waterfront Development Corporation, who hires one or two people for the summer. There are washroom and shower facilities, which, as of this summer, are exclusively for the boaters. There is a seal boat tour that operates out of the marina, as well as Waveskills sailing school. There is a small restaurant, and gift shop on site. We can get our diesel at the dock, although there is no pump out facility. The biggest down side of Montague is that it is a bit up the river. We usually have to motor for about 45 minutes before we can raise the sails. However, we tend not to take too many day trips, but instead concentrate on overnight or longer cruising, so it's not much of a penalty. We’ve been quite happy with the decision, mostly because of the other sailors that are in the area. There is a mixture of people who are just starting their sailing journey, as well as the old sea dogs who have been at it for a while (yes, I’m talking about you, Mel). It is never difficult to find someone to supply advice or assistance when needed. Last year, at the end of the season, a five-boat convoy made the journey from Montague to Souris for an overnight trip. Although we were partly becalmed on the way there, it was a beautiful day. And the trip back was perfect sailing weather. I know there were a couple of other boats that wanted to join in as well, but the timing did not work for them, so we’ll be sure to organize a couple more joint trips next year. Jay mentioned in an earlier blog his challenges learning to do maintenance on a boat. Well in 2008, our first year with the boat, we had several challenges and learned several lessons. I have already described the starter problems and alternator belt problems in earlier posts. We also had to contend with a cracked sheave which resulted in the main halyard jamming. We had to send Mel Campbell, a local experienced sailor, up the mast to diagnose the problem, and then up again to replace the cracked halyard with a new one. Lesson Learned - check all sheaves, attachments, lines, rigging, etc. very carefully before hoisting the mast. It is much more difficult to fix the problem when it is 38 feet in the air. Another day we were out for a day sail with family. It was a beautiful sunny day and we had sailed to Boughton Island, anchored, went swimming and lazed in the sun. On the way back, we decided to sail off the anchorage. We unfurled the genoa and sailed away. About fifteen minutes later, I heard a thunk as something hit the top of the deck and the foresail started collapsing. The jib halyard had snapped. We recovered the jib, hoisted the main and continued under sail. Later we noticed the jib halyard had frayed and had just finally snapped. Lesson Learned - check all lines regularly for signs of wear. Near the beginning of the year we were out for a day sail with a friend when we ran out of diesel. It takes about 45 minutes to motor up the Montague River to Cardigan Bay. We were returning under motor when the engine sputtered and died. Although we had extra fuel aboard, the engine would not restart as their was now air in the lines. We anchored in the channel in the river trying to get it restarted. Unable to after 20 minutes or so, Jay decided we were a sailboat after all, and should just sail back to the marina. Luckily, the wind was coming from the right direction and we were able to broad reach and run back to the marina. It was a great test of our skills to dock under sail alone in the strong current in the Montague River. Lesson Learned - Check fuel levels before setting out. We have also since learned how to bleed the fuel lines properly! We also nearly lost our mast that first year. We were out on an Intermediate training weekend with Waveskills in about 20 knots of wind under foresail alone, practicing some manoeuvres. I was on the helm. All of a sudden there was a popping sound and the foresail started flapping crazily in the wind. My eyes had trouble comprehending what I was seeing. On Obsession, there is no separate forestay. The roller gear acts as the forestay. The top of the furling gear had let go and the only thing holding the mast upright was the jib halyard and jib. As I bent down to put the gear shift in neutral so we could start the engine, I felt the backstay slacken and sag against my back. Everyone on board immediately moved to take every halyard possible to any secure point on the bow to help stabilize the mast. Jay and I were thankful to have Ellen MacPhail, Waveskills owner and very accomplished instructor and sailor, aboard to help us. We recovered the jib and made it back to the marina. After sending Mel up the mast once again, we identified the culprit as a small set screw that had backed out and under pressure, the two pieces had come unscrewed. We fashioned a new set screw, and a few days later, had the furling gear reassembled and were back in business. Lesson Learned - if you are not careful, the failure of a 10 cent screw, could mean a several thousand dollar repair bill. Check all rigging and gear regularly. Oh, and one other lesson. Keep the phone number handy for Mel - he is always ready to climb a mast. From our home base in Prince Edward Island, it is just one day’s sail to the Bras D’Or Lakes, which are arguably the best sailing grounds in Eastern Canada. This lake is large enough to offer plenty of open water sailing, but small enough to block the worst of the Atlantic’s weather. The shoreline is full of deep, sheltered coves to pull into for an afternoon’s swim, or an overnight anchorage. Although the bottom is rocky and hard in many places (unlike the keel-friendly sand bars of Prince Edward Island), the dangerous areas are actually few and well marked. We’ve now visited the lakes each of the past two years, and have only touched on the areas we would like to explore. From PEI, the most efficient way to reach the Bras D’Or Lakes is through the Canso Causeway and Lennox Passage, then the St Peter’s Canal. I grew up in the little community of L’Ardoise, only a few kilometres away from the St Peter’s Canal. When you live in that area of Nova Scotia, the village of St Peter’s is the principal service area, having the bank, pharmacy, grocery, and hardware stores. Also of interest to sailors is the top quality marina in the community, with all of the amenities within walking distance. When anyone from the area talks about “going to town”, what they mean is they are about to make a trip to St Peter’s. My home in L’Ardoise is just next door, but on the opposite side of the canal from most of the town. Any trip involved a drive over the bridge crossing the canal. 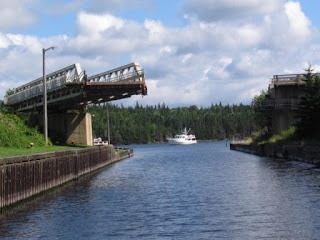 It was always an event to be stopped at the swing bridge so that a boat could pass underneath. People in the cars closest to the locks would generally get out of their vehicles and watch the boat or boats pass, waving to the sailors on deck and snapping pictures. I was often among the group watching. Our first season with Obsession, we made the trip to Cape Breton late in the season. I have to admit, one of the highlights of the trip was making the canal passage. After traversing the locks, we made our way up to the bridge, and they swung it open to let us through. For the first time, after spending many years watching from up above, we were the ones responsible for stopping the line of cars on the highway. The occupants climbed out to watch us go by, many of them waving to us. For me, personally, it was a great way to start off our visit. As I mentioned in my last post, we sailed back to our home port of Montague, PEI from Ballantyne's Cove, Nova Scotia in early September 2008 on the last day of our first major cruise with Obsession. We had had an eventful crossing through the Strait of Canso and across St. George's Bay the night before. But our last day was also far from uneventful. As I look back at my log entries from that trip, I notice we motorsailed for a good part of the day. When we had set out that morning from Ballantyne's Cove across the Northumberland Strait, there was a great breeze and we were doing 5.5 knots under full sail on a broad reach. After a few hours, the breeze slackened and our boat speed fell to 2.5 knots. The weather had been forecasting 15 knots by noon, it was 1230 and there was only 6 knots apparent according to our handheld windmeter. We left the sails up as the wind direction was right and there was almost no swell (unlike the night before), and turned on the engine. We were over half way across the Strait when the oil alarm went off. We immediately turned off the engine and checked the oil levels. All was well. We let the engine sit for 20 minutes and then turned it back on and all was ok. The alarm did not go off again and water seemed to be coming from the cooling system as usual. We had been running the engine a bit harder than usual though when the alarm went off. The clouds had started rolling in. Thunderstorms and rain was forecast for that evening and we wanted to get home before it hit. We had been motorsailing for about an hour, riding a favourable current which was giving us a speed of about 7 knots according to the GPS, when the clouds darkened and it started to rain. After a few minutes there was a flash of lightening way off in the distance. Jay was in the middle of making nachos in the oven. Afraid that the wind might suddenly increase if a thunderstorm hit, I called to Jay to come up and help take down the sails. He turned off the oven and we pulled the sails in and continued under motor alone. About 3.5 nm from Panmure Island Lighthouse it was raining and I was in the cockpit in all my rain gear steering, eating the nachos which Jay had put at the top of the companionway just under the dodger. It started to rain harder. Despite the fact that we had checked the weather forecast and weather radar over and over before heading out and while under way (Blackberries are handy that way) the rain and thunderstorms which were not supposed to hit until evening, found us around 2:30pm! Our first time in a sailboat in a thunderstorm. We were still 2 NM from Panmure lighthouse when the lightening started in earnest and the rain started to come down even heavier. All of a sudden I could no longer see Panmure lighthouse. What rain!!! We checked we were in no danger if we drifted, so we left the engine in neutral (being afraid that if we turned it off it might not start again given our experience the night before) and went below. Being careful to touch nothing metal while the thunderstorm passed over us, we huddled in the salon waiting. What an eerie feeling to be below and hear the crack and boom of thunder and lightening all around you, but not be able to see it. Luckily, the wind did not pick up. It only lasted 15 minutes or so and then the thunder and lightening moved off and we came back out. The rain did not really let up much though. Visibility was terrible and I was relying on compass and GPS as I put the engine back in gear and pointed Obsession once again towards Panmure Island. The last ninety minutes of the trip it continued to rain hard in downpour after downpour. As we entered Cardigan Bay and motored up the Montague River, we would watch wall after wall of rain approach, completely obscure our visibility, and then pass over us after a few minutes. Often, we could not see the nearby shores of the river. Surrounded by curtains of rain and fog, it was as if we were completely cocooned and in a little world of our own, all alone. Then, as the heavy rain would move on, we would catch glimpses of the red shore, until the next curtain of rain approached. When we arrived in Montague that afternoon, we were soaked, but more experienced sailors after our three week cruise. Today Jay and I went to Ballantyn'e Cove, Nova Scotia. We have been there a few times in the past two years, but this was the first time we arrived by land. Ballantyne's Cove is approximaely a seven hour sail from Montague, PEI. This makes it a nice destination for an overnight or a weekend sailing trip. 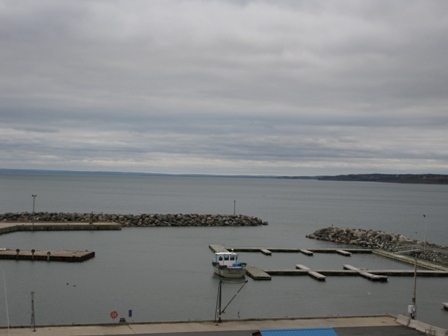 It is a small fishing port with a 40 slip marina and a Tuna Interpretive Centre. 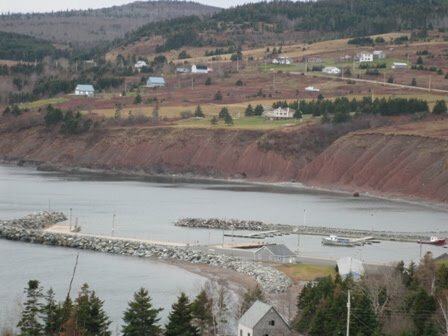 Located about 30 km north of Antigonish on the north shore of Nova Scotia near Cape George, this port offers a nice protected harbour with a high breakwater. Although most boats have been hauled for the winter, there was still a beautiful view of the marina and St. George's Bay. The Tuna Interpretive Centre, which also houses the marina office, showers, and laundry facilities for visiting sailors was closed for the season, but in season, the facilities are clean - though you have to pay for the showers. Diesel is available and you can buy crushed ice used by fisherman to replenish your icebox, though it should not be used in any cold drinks. In season, there is also a small take out place with good fish and chips. Over the past couple of years, we have sailed to Ballantyne's Cove a few times, although one of our visits last year was quite memorable. We had taken a three week cruise - our first long trip with our new boat. We were so proud of ourselves as we had been having a few minor issues with the engine during that trip - twice we ran into a situation where power was not getting to the starter - but after 5 minutes or so with playing with the wires, Jay was always able to get the engine started. For new boat owners and untried sailors this was great progress. On what was supposed to be our final day of our big trip last summer, we left St.Peter's, CB for Montague. It was a beautiful day and we had a great sail (motored thru the bridge at Lennox Passage), then sailed thru the Strait of Canso. Jay made muffins while under sail. We talked on the VHF to a supertanker that kindly warned us he was casting off and suggested we make our way to the other side of the Strait. We ate fresh muffins with fresh brewed coffee, remarked how beautiful a day it was for sailing, and decided that life just could not get any better. It was late afternoon and we were looking forward to our first night sail across the Northumberland Strait. As we approached the Canso Causeway, we pulled down the sails to start the engine to motor through the bridge and lock. On the other side of the lock, it was less windy as the wind was blocked more by the hills, so we motored for awhile. As we left the Strait of Canso and entered St. George's Bay, the swells were larger, much larger than they had been on the other side. But the wind seemed to be a bit stronger so we decided to try the sails again. We unfurled the foresail and turned off the engine. However, the wind was just light enough that it could not keep the sail filled constantly as we were tossed by the swells. So we decided after 15 minutes of being tossed around to not bother putting up the main, refurl and to restart the motor. Jay went forward to furl the foresail and I tried to start the engine. When I tried to start the engine, it wouldn't start. Same as the problem we had had a few weeks ago. The engine panel was not lighting up - no power to the starter. We were in the Bay, so no worries about drifting into anything. There was nothing around and plenty of depth under the keel, so Jay came back and started fiddling with the wires while I went forward to pull out the jib again. Because we had been intending a night sail, I had already set out the jacklines. The boat was bouncing us about so much with no steerage that I donned my life vest and clipped on to go forward and pull the sail back out. The furler was temperamental and sometimes it would jumps its track and then jam as the drum casing was cracked (it has since been replaced! ).It was one of my most exciting experiences moving to the bow of a boat! The boat kept falling away from under me as I made my way forward, hanging on for dear life. Of course, the furler would always misbehave when we were being tossed about or in high winds, never in calm weather. After I managed to get the line unjammed and pull the sail out, only getting slightly soaked from the bow splashing down in swells, I came back to the cockpit and tried to steady the boat as much as I could in almost no wind and in high swells with little to no steerage. We were making a measly 1.5 knots. After about 20 minutes of Jay poking, prodding, trying the key, tearing apart the engine panel, checking the battery, fuses, wiring harness, etc., Jay just tried the key, and it worked. He had found nothing wrong, but this time, Obsession decided to start. We wasted no time in furling the genoa and getting under way. Of course, after having his head upside down for so long bouncing around, Jay was now feeling queasy - an unusual situation for him. I was also starting to feel a bit off too, so I took the wheel (which seems to be my remedy when I start feeling off.) At this point, I made an executive decision to head for Ballantyne's Cove. It was still about 18 nm, but with Jay feeling nauseasous, with me feeling a bit less than 100 per cent and with the swells increasing and an unfavourable wind, going on to Montague made no sense at all. suggested he take it easy, so he huddled against the pushpit, while I was on the wheel. He was not in imminent danger of being sick, he just felt yucky. What had been a beautiful day of sailing earlier that day had turned into a real slog under power. It was now getting dark, and there was no point in turning off the engine, which might not start again to tighten the belt as it would be too hot to touch right then anyway. We were both tethered to the jacklines and so we pushed on. Although the waves were not as high as they were the day we went from Dundee to St.Peters in 22 knots with our head to the wind (we had to motor for 90 minutes that day into high waves and I got absolutely drenched) in a way it was way more unnerving. For the last hour we were being hit by the waves almost broadside - a bit to the stern. It was hard to see them coming in the dark and so sometimes I would glance to my right and see a wave right beside the boat which were at the height of the lifelines and I had to react quickly. It was more eerie in the dark, as I could not see what was coming. Anyway, we made Ballantyne's Cove just before 10pm that night and I was never so happy to pull into a marina. Even the fact that they were experiencing a water pressure problem, so no showers, was not enough to dampen my mood. The next morning Jay tightened the fan belt and there was no problem starting the engine. We sailed back to PEI and Jay later replaced some wiring which had corroded. That problem seems to have been rectified. Today, as we stood overlooking the now almost completely empty marina at Ballantyne's Cove, I thought about that passage and how thrilled we were that night to pull into its protected waters. The first two years of owning a boat is quite a learning experience. I have never been one to tinker with engines or with mechanics much, but when you own a boat you don’t have much choice. I’ve fallen into the role of chief mechanic on Obsession 305 with a steep learning curve. Since our boat is over 20 years old now, it’s understandable that some parts are wearing out and corroding. There are still a couple of ongoing areas that I’m working on. Electrical connections in the engine seem to be a problem. They are starting to corrode. This past spring, we put the boat in the water, and went to turn on the engine. No luck. We were below the crane, trying desperately to get out of the way so that the next boat could get lifted in, but couldn’t get the engine started. We pulled the boat out of the way, and after a few hours, worked out that there was a problem with power getting to the starter. Thankfully, my father-in-law was handy, and he was able to bypass the starter and get us going. Ironically, the engine then wouldn’t turn off (although this wasn’t electrical – the cord to stop the engine had slipped). Since then, there have been a few other electrical components that have had to be replaced. Keeping our radio working has also been a problem, since the coaxial connector also wants to keep corroding. I have to replace the connection in the spring. Oh, the joys of boat ownership! Last month Jay and I spent Thanksgiving weekend in Annapolis MD at the US Sailboat Show(http://www.usboat.com/), the world's largest and oldest in-water show for new sailboats. Wow! We spent two days at the show and enjoyed visiting vendor booths, hopping aboard a good number of beautiful sailboats, and visiting the Annapolis area. It was our first opportunity to view some of the multi-hulls, whch were really nice boats. We met up for dinner with fellow Island sailors, Ian and Julie, who were also taking in the show. As we were flying, we did not buy much, but would certainly put this event on our schedule again in future. Well, the 2009 sailing season is now at an end in Prince Edward Island and so it is time for me to return to armchair sailing again for the winter. This year, I thought Iwould create this blog to talk about sailing in Prince Edward Island and the Canadian Maritimes, general thoughts on sailing, interesting articles and books, and our travels with the s/v Obsession. This was our second year with "Obsession 305", a Beneteau First 305, which my husband Jay and I sail out of Montague, PEI. Jay and I bought Obsession in May 2008. As new sailors and new boat owners, the past two years have been exciting and sometimes a bit anxiety inducing. This blog is meant to share some of the things we have learned, some of our passion for sailing, and some of our adventures. In 2009 we sailed 988 NM by doing several day sails, several short trips to other ports in Prince Edward Island (Charlottetown, Souris, Murray Harbour and Brudenell) and Nova Scotia (Ballantyne's Cove and Pictou), and a two week trip to Nova Scotia's Bras D'or Lakes in Cape Breton. In 2008 we had managed only 778 NM with day sails, overnight trips to ports in PEI and a three week trip to the Bras D'or Lakes, so 2009 was a definite improvement. But if you had of told me five years ago I would be skippering my own sailboat, I would never had believed it. Jay and I had only learned to sail keelboats in 2006 when we took the CYA Basic Cruising Standard from Waveskills (http://www.waveskills.ca/), which is based in PEI. This course and the Instructor, Ellen MacPhail, ignited an absolute passion in me for sailing (which delighted Jay, who never could get me to enjoy sailing his Laser) and gave me the confidence to do something I had never done before. Jay and I spent 2007 sharing with other former students the use of a 20 foot Santana, which Waveskills owned, getting several additional certifications through the Blue Heron Power and Sail Squadron (http://www.blueheroncps.pe.ca/), and searching for our own sailboat. In 2008 we both acheived our CYA Intermediate Standard (Skipper). This year we entered our first Northumberland Strait Yachting Association (nstya.com) Race! Now with Obsession safely tucked away for the winter, I intend to spend time dreaming and blogging about sailing as only one who is truly obsessed can!